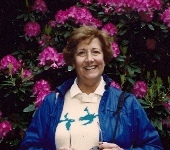 Arlene F. Spierling, 91, of Willow Valley Manor North, Lancaster, PA, died October 17, 2011 at The Glen at Willow Valley. She was predeceased by her husband, Richard A. Spierling. Born in Tunkhannock, PA she was the daughter of the late Judd M. and Louise Lynch Fitze. Mrs. Spierling was a member of St. James Episcopal Church, Lancaster. A graduate of Keystone Academy, Syracuse University and Penn State University, she was a speech and drama teacher at Montclair, NJ and Port Jefferson, NY. Upon her retirement, she was able to continue pursuing her love of drama and acting at Willow Valley. She and her husband were world travelers and, particularly loved Great Britain and Africa. Mrs. Spierling is survived by a niece, Deborah F. wife of Henry Rhoads of Audubon, PA (and their children Melissa and Kevin Rhoads), and a nephew Judd B., husband of Dianne Fitze of Tunkhannock, PA (and their children Chris, husband of Bree, and Corey Fitze; and a sister-in-law, Ruth Fitze of Lancaster, PA.
She was predeceased by her brother Clarence J. “Klee” Fitze. Relatives and friends are respectfully invited to attend an memorial service in the Johnson Auditorium of Willow Valley Manor North, 600 Willow Valley Square,Lancaster, PA on Thursday, October 20th at 11:00 A.M. The family will greet friends immediately following the memorial service. If desired, contributions in Arlene’s memory may be sent to the Dietrich Theater Flood Recovery Fund, 60 E Tioga St., Tunkhannock, PA 18657. So sorry to hear of Aunt Arlene’s passing – the Spierling nieces and nephews and her sister-in-law Anne Spierling aren’t mentioned in the obit above, but we also have many wonderful memories of this amazing and inspirational lady. She has touched our lives and will live on in our memories! Condolences to the Fitz family and Aunt Arlene’s friends from Willow Valley. So sorry we are unable to join you for the funeral today but you are in our thoughts and prayers.